David loves to share his passion for gardening and help others delight in the wonders of growing and caring for incredible plants. Hydrangeas are common selections for gardens due in large part to their radiant beauty and the fact that you can change the color of their blooms by altering the pH levels of the soil. Though they may look intimidating to a new gardener, hydrangeas are quite hardy and forgiving. Growing them is often rewarding, as the flowers they produce can be used to amplify an already beautiful garden or enhance a subtle one. The flowers can also be brought inside to enhance surroundings within a dwelling. They can also be dried and made into ornaments that can last for a long time. 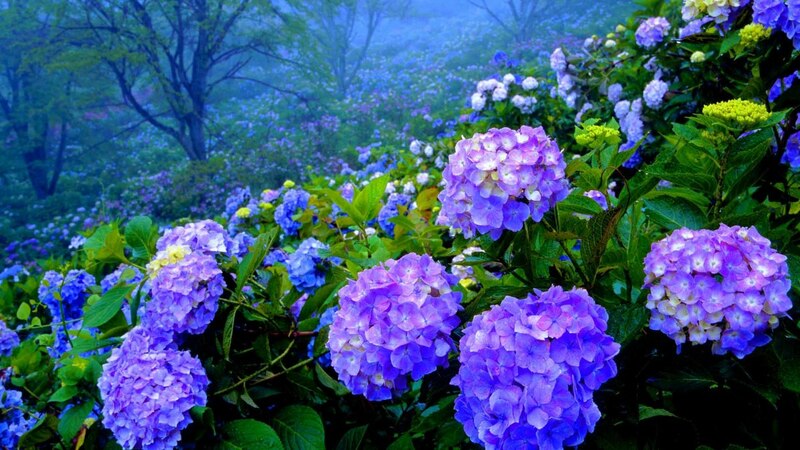 Hydrangeas were first discovered in Japan to be used as an ornamental plant in a garden. The etymology of the name "Hydrangea" is derived from ancient Greek with "hudro/hydro" meaning water and "angeion" meaning vessel. In modern times, we see hydrangeas in many gardens due in large part to their overall beauty and ability to add density and detail to any garden or yard. Native to East Asia and the Americas, the shrub is an easy plant to cultivate and propagate. Proper care of this plant will provide many years of beauty for outdoor and indoor use. 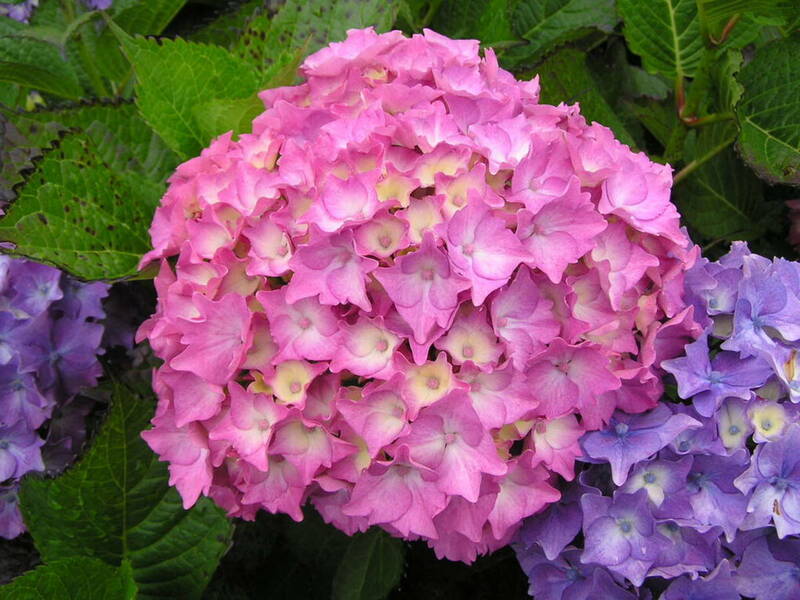 Hydrangeas are characterized by their unique, small, and dense flower formations called corymbs, which grow in spherical or half-spherical clusters. Their leaves are relatively broad and semi-waxy. They can range from forming dense shrubs to loose clusters to tall tree forms. 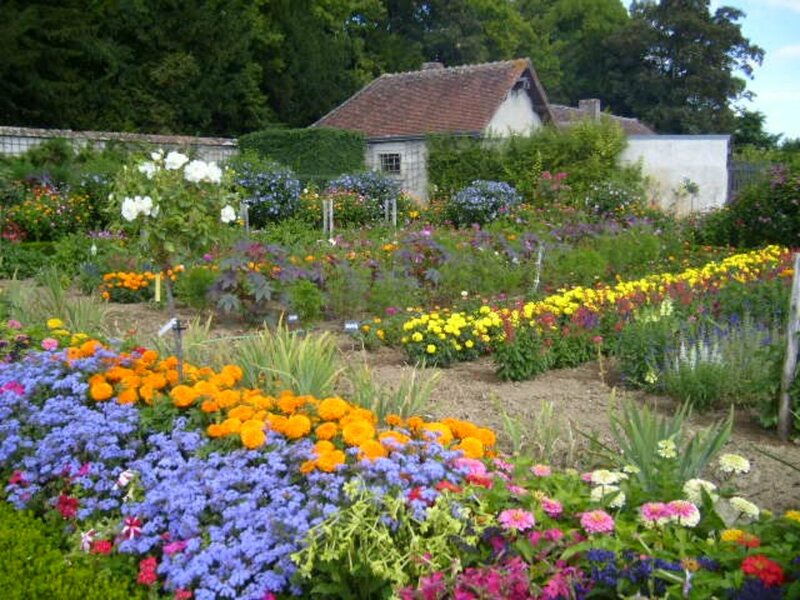 Perhaps most notable, however, is the fact that the color of their flowers can be altered by applying additives to the soil to raise or lower the pH level. 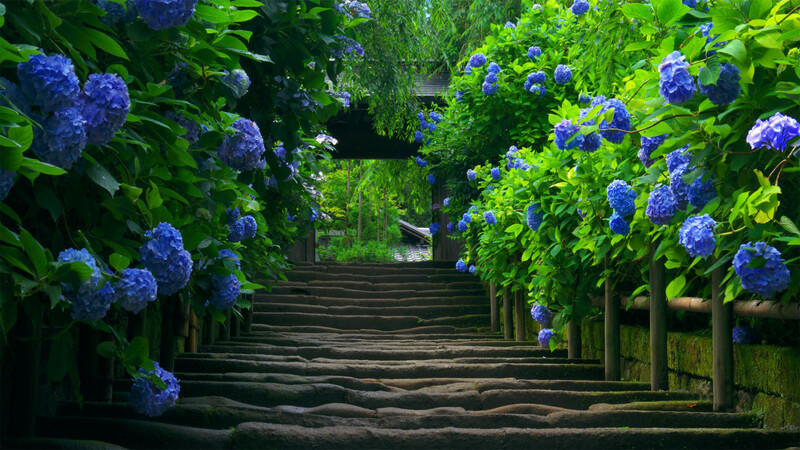 A garden path lined with gorgeous blue hydrangeas. Which Species Should You Grow? It's important to know which hydrangeas you want, as there are different characteristics and features unique to a few select types of hydrangea plants, and each kind requires certain care and maintenance. 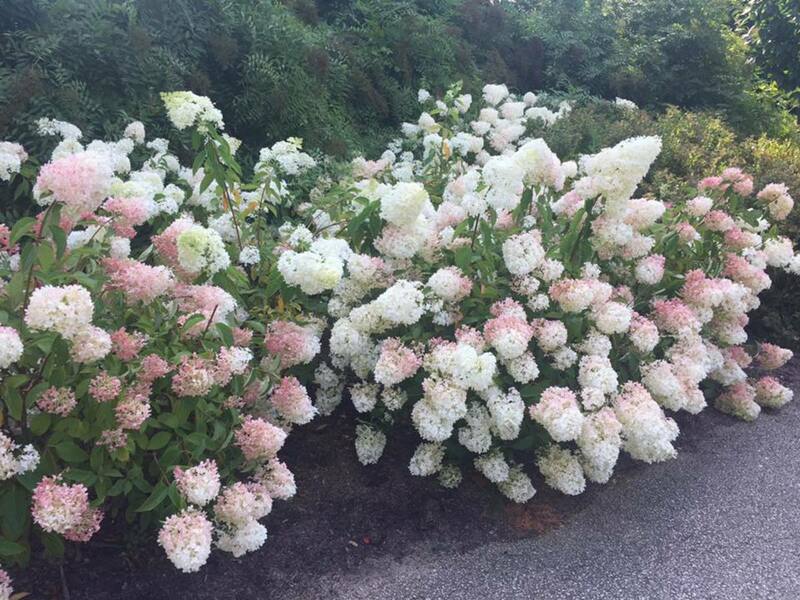 For a long period of time, Annabelle was the standard type of hydrangea, as it was the most hardy and also produced the largest clustered blooms. It's common to grow this as a hedge plant, since it can take a hard prune and still bounce back. It will bloom once a year without fail, but only produces white blossoms. (The color of its blossoms cannot be altered by changing the pH level of the soil.) The only real flaw to this species is quite ironic, as the prized blooms are actually its greatest weakness. They occasionally will become so heavy that they'll weigh down the shrub, causing it to sag and possibly topple over. 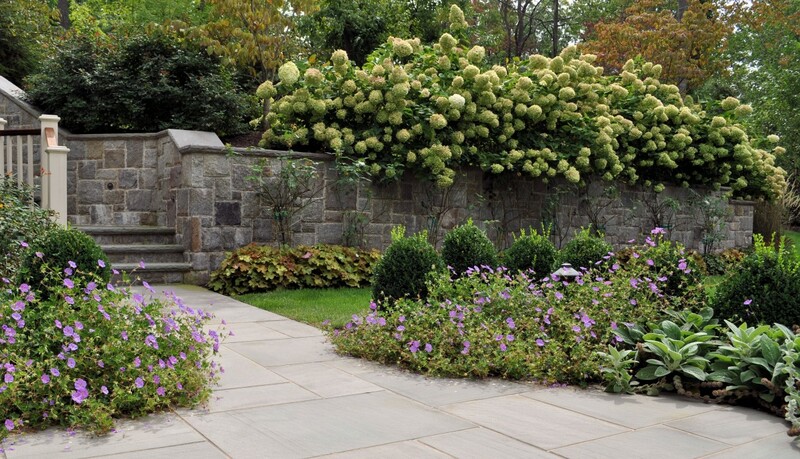 These hydrangeas are more subtle and less dense, adding grace and simplicity to gardens. They are identical to the mophead variety but with one difference: the flower blooms. 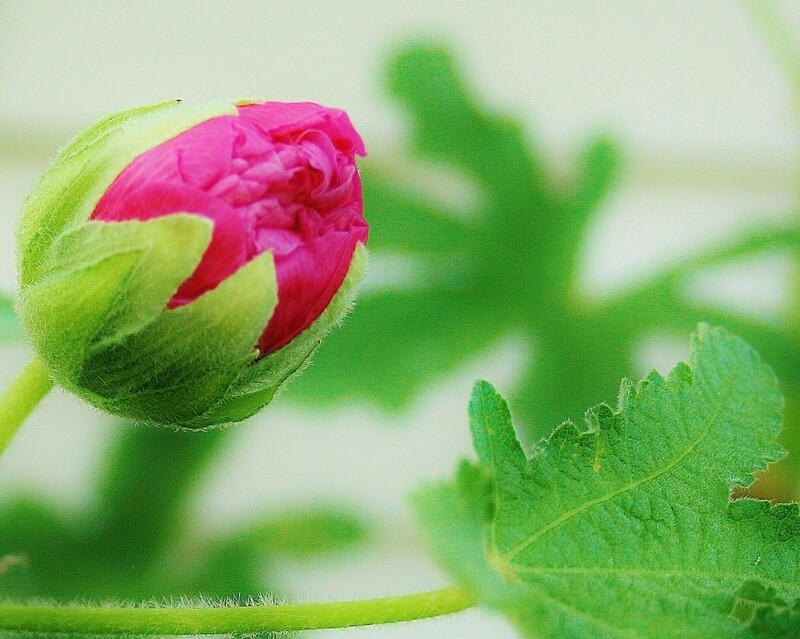 Notice that the blooms happen around a cluster of still-yet-to-bloom buds. The difference between the two is that the outside blooms of the lacecap are sterile while they encase the fertile cluster of blooms. This bloom formation is what gave rise to its name, as the intricate center is highly detailed like lace. This species needs shade to do well. This is probably the most popular hydrangea plant grown in gardens and is very similar to the lacecap. The main feature exclusive to this species is its radiant colors, which show immediately on fresh blooms. It also needs shade to do well. This species of hydrangea is named oak leaf for its strikingly large leaves, similar to those of an oak tree. These hydrangeas can tolerate much more sun than the lacecap and mophead. Because of its namesake, this tree has something to look forward to at every part of the year, even when it's not blooming. During fall, this variety's broad leaves will turn a brilliant red hue. 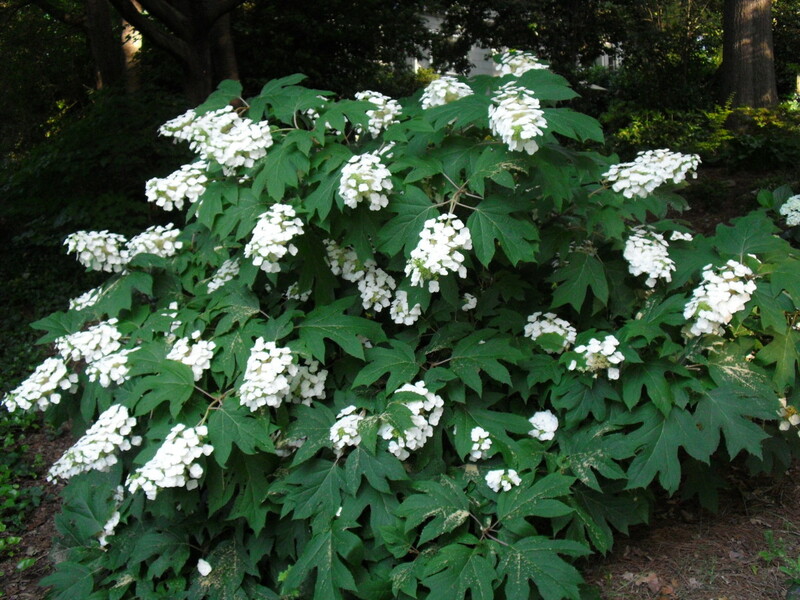 This species also displays white blooms. This hydrangea species is one of the largest. They can get from anywhere from 8 to 13 feet tall. Unlike mopheads and lacecaps, these will need some time with direct sun to do well. This is the only species that can be trimmed and formed into a tree, if desired. They are very forgiving and can be pruned at any time (other than when blooms are forming). 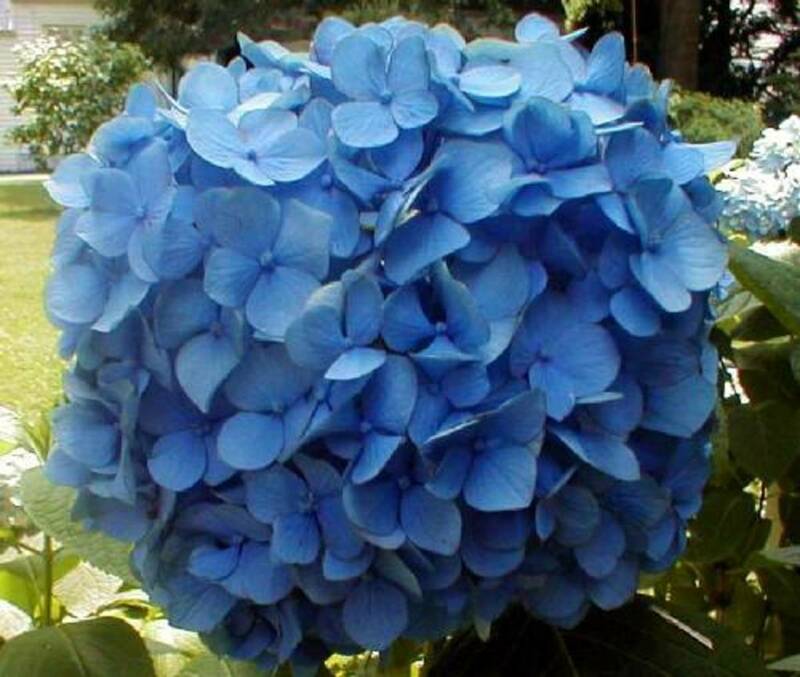 How Do You Change the Color of Hydrangeas? Hydrangeas are nature's pH strip for the soil. Visually, the flower's color is a very clear indication of the pH levels of the soil. 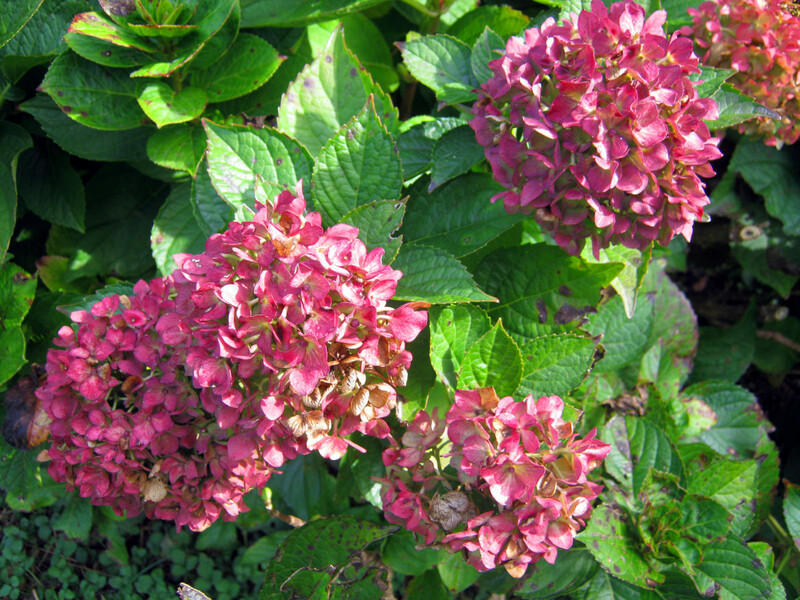 This ability to manipulate its bloom's colors is a big part of why hydrangeas have become so popular. This is not an overnight process, however. It can take months, if not years, to condition the soil and maintain the optimal pH levels. Thus, many gardeners pride themselves in their ability to change the shrub's color at will. Unfortunately, not all hydrangeas are created equal. Out of the various different species, the mophead and lacecap hydrangeas are the only two that can have their color modified. How Do You Get the Colors You Want? Hydrangeas naturally absorb aluminum, and the color of their blooms will reflect how much is present in the soil. By altering the amount of aluminum in the soil, you can nudge the plant toward developing the more coveted red/pink hues. Alternatively, you can add dolomitic lime to the soil to help encourage the development of pinker blooms by having a more basic pH level. If you want more blue hues in your blooms, try mixing in garden sulphur for a more acidic pH level. If purple is more your style, try to keep the pH level of the soil as neutral as possible (around 7.0). Note: Because this plant is so sensitive to pH differences, even the water that is used should be carefully scrutinized, as it may contain minerals that can throw off the pH levels. It's often common practice to collect rainwater and use that as the irrigation medium of choice when watering hydrangeas. How Much Shade Does It Need? It is important to know which species of hydrangea you have, because shade can play a very important role in the health of the plant. There are species that require direct sunlight for nourishment, while others need indirect sunlight and lots of shade. When growing mopheads and lacecaps, it's important to find an area where the sun still penetrates but can provide enough shade to shield it from ever getting more than 30–60 minutes of direct sun exposure a day. This doesn't mean that you should plant the hydrangea in complete shade, though. No hydrangeas do well in full shade. 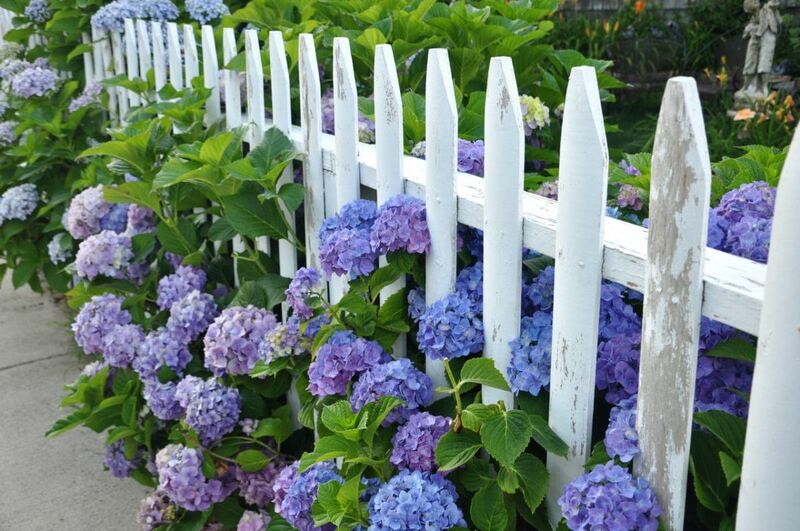 If placed in complete shade, hydrangeas will under-develop their clusters of blooms and possibly die in a few years. Note: Pergolas can be used to provide shade to mopheads and lacecaps and help protect them from direct sunlight. This diagram shows how to properly plant your hydrangeas. 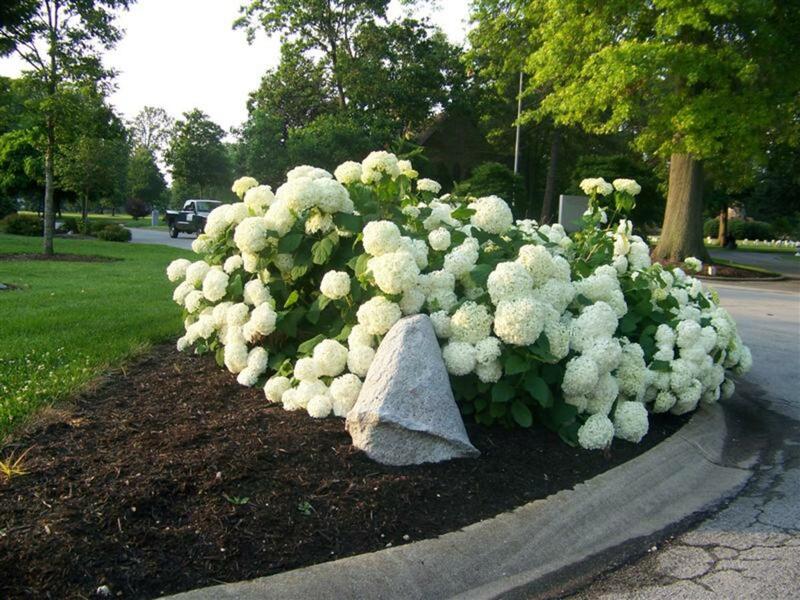 The best time to plant hydrangeas is in early summer or late fall. Find an area that will allow the plant to grow to at least 4' x 4', though some might grow a bit larger. 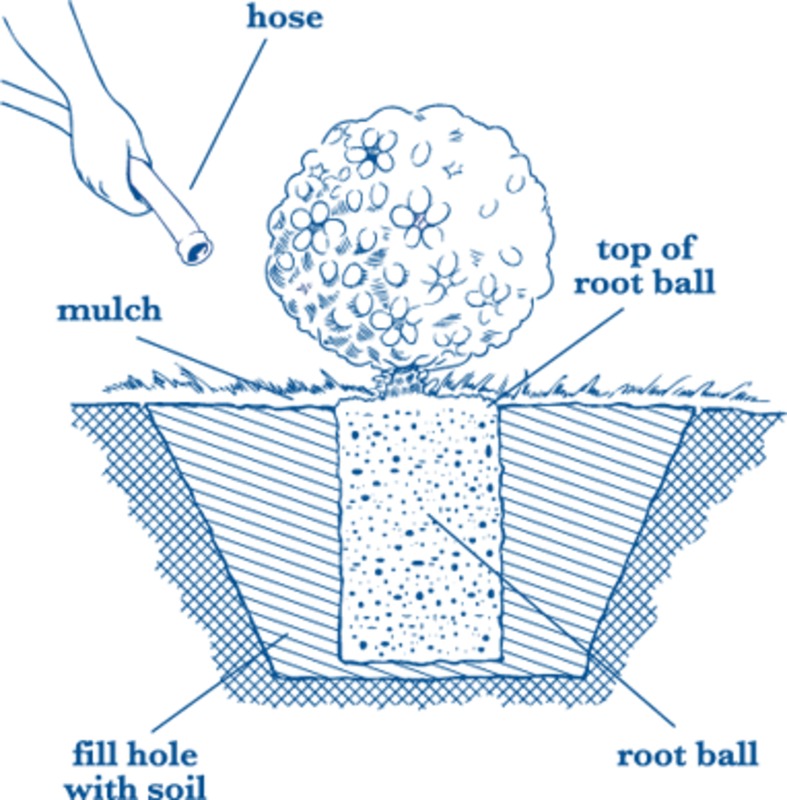 Dig a hole that is the same depth as the root ball that the plant came in. The current soil surface level in the container can serve as an indicator of where to bury it up to in the soil. Soil composition is also important. 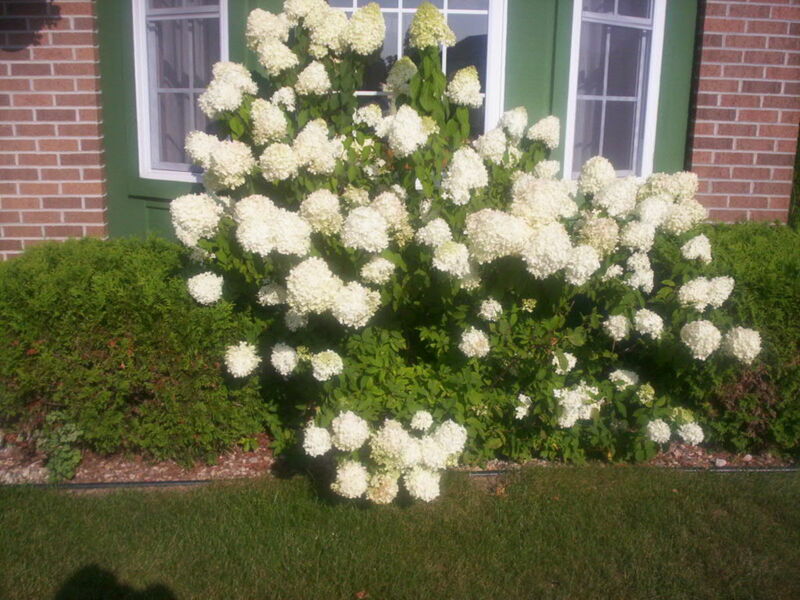 Do not plant in clay, as this retains an overabundance of water and can lead to root rot that can kill your hydrangeas. Conduct a test by digging a 1 foot hole into the ground where said hydrangea will be planted. Fill the hole with water, and let the water stand. If the water completely disappears within 15 minutes, the soil is good enough to plant. Any spot that takes more than 30 minutes to drain will be too compact and may do harm to your hydrangea. How Often Should You Water Your Plant? Watering should be done religiously regardless of whether the plant is in a container or in the ground. As hardy as these plants are, however, they are rather fussy when it comes to water intake. 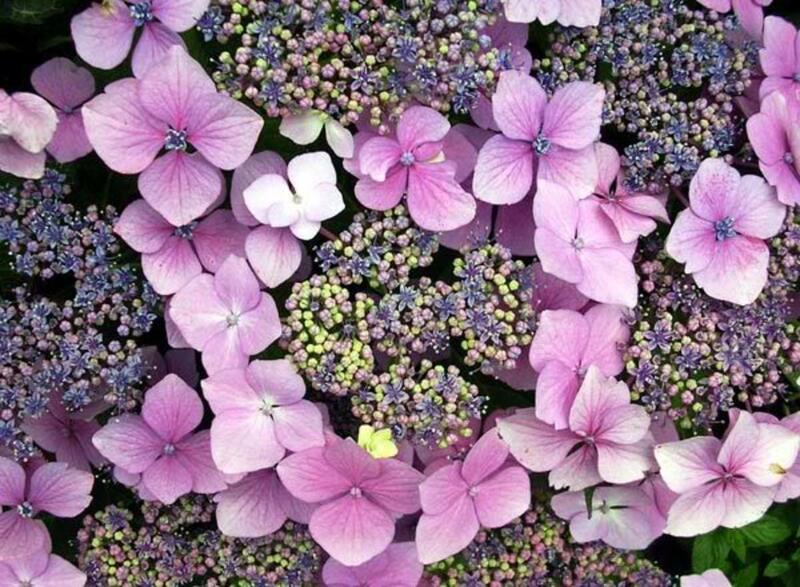 Hydrangeas like moist soil, but not drenched soil. If their flowers are exposed to wind, direct sun, or heat, they will dry out considerably. To defend against that, the plant itself will need quite a bit of water. If possible, install a drip system (instead of overhead watering), so the soil is kept moist. Overhead watering can cause lots of pests and diseases from the wet leaves. Drip systems also use up less water in the long run. They keep the soil directly under the plant moist, rather than staying on the leaves and eventually evaporating. It's wise to water the plants once a week so that the water is fully absorbed from about 9–10 inches beneath the soil surface. During times of considerable drought, it's wise to water twice a week to ensure maximum soil moisture. It's also advised to apply mulch to the base of the shrub to ensure effective water retention. However, applying mulch will require an adjusted watering schedule to ensure that the soil does not get oversaturated and to prevent root rot. Even the water you use can affect the pH level of your soil. 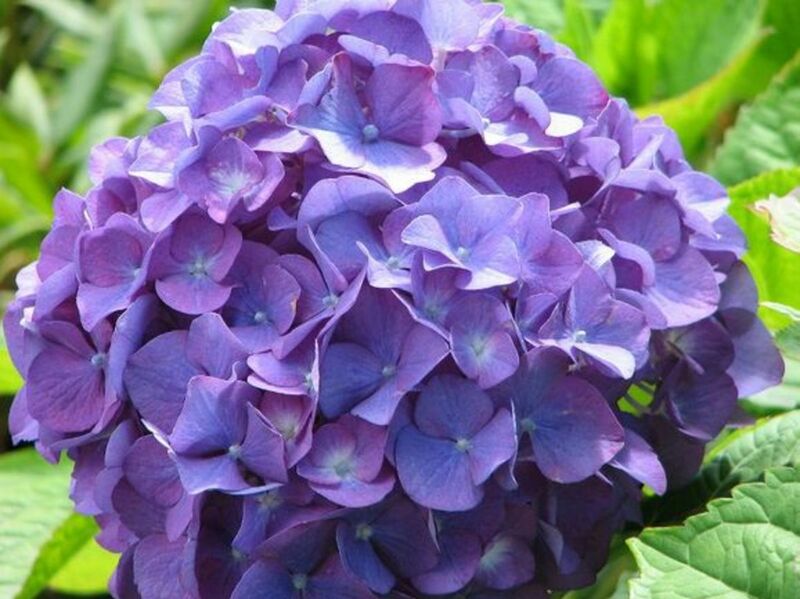 So if you need some neutral pH water, consider collecting rainwater and using it to irrigate your hydrangeas. As critical as it is to make sure your plants are well irrigated, it's also important to be on the lookout for symptoms that might indicate that you're overwatering. Visible roots will show signs of fungus growth and decaying matter around the base of the tree where roots are exposed. If you see any signs of this, it might be advisable to consider watering less frequently to give your roots a chance to recover. Damaged root systems will take an overall toll on the whole shrub. Because not many would go digging into the soil to expose roots, diminished buds are a good indication that the shrub is not doing well. Lesser clusters will amount to fewer blooms. If root rot is apparent in the flowers, leaves will show a considerable sign as well. Because there has been some damage to the roots, leaves can turn yellow rather than their rich, dark green hue. Defoliation is also a sign of overwatering. It's important to know that just because a plant looks weak or potentially in trouble does not mean that fertilizer should be applied to it. 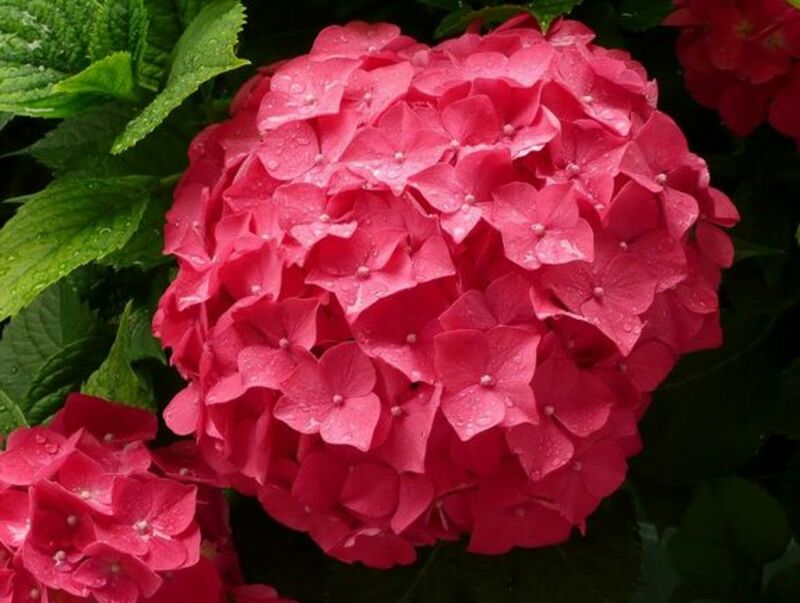 You should generally only fertilize your hydrangeas once or twice a summer and refrain from fertilizing them after summer. 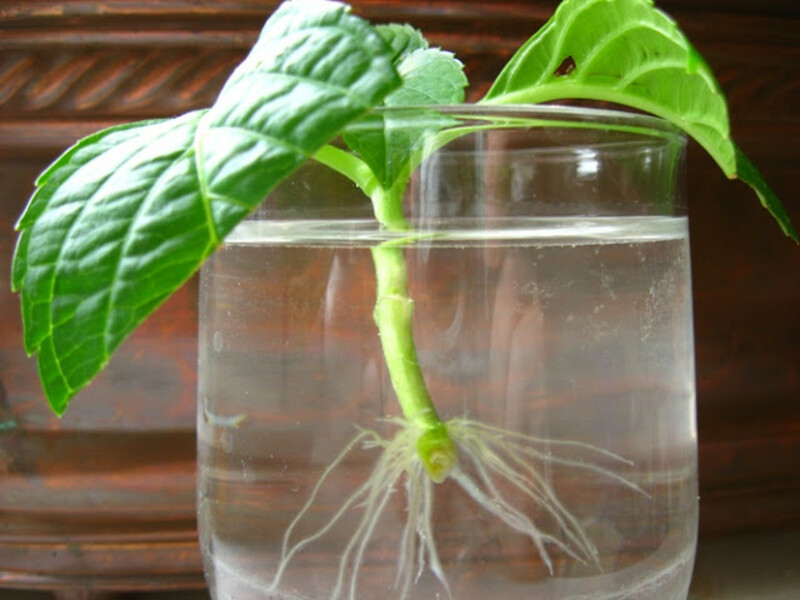 A hydrangea cutting that was placed in water is establishing roots. Hydrangeas can take root from cuttings very easily. This means that if you were to cut a hydrangea and place it into the ground or water, it is likely to develop roots without any encouragement. When you want to take a cutting from a hydrangea, it's best to take a non-flowering stem. Cut back all but four leaves and leave about 6 inches from top to bottom. Dipping the stem into rooting hormone can greatly improve your chances of establishing that cutting. 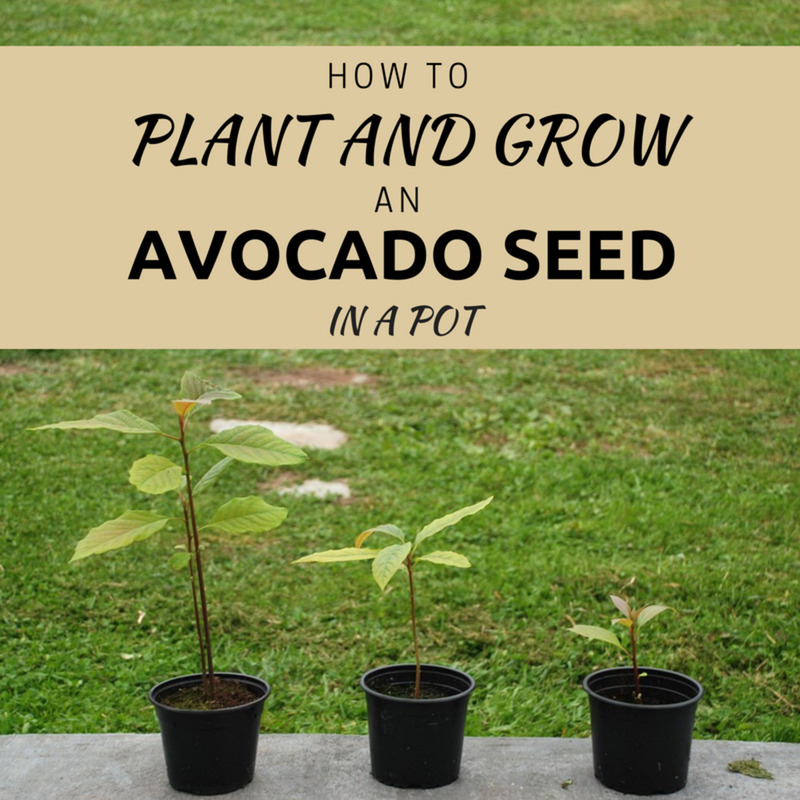 If successful, take the stem and leave it in a container of soil for a month or two to establish roots. Wait until planting season, then place the whole plant into the ground. It is best to get cuttings in early summer, so the new cuttings can get established and mature. 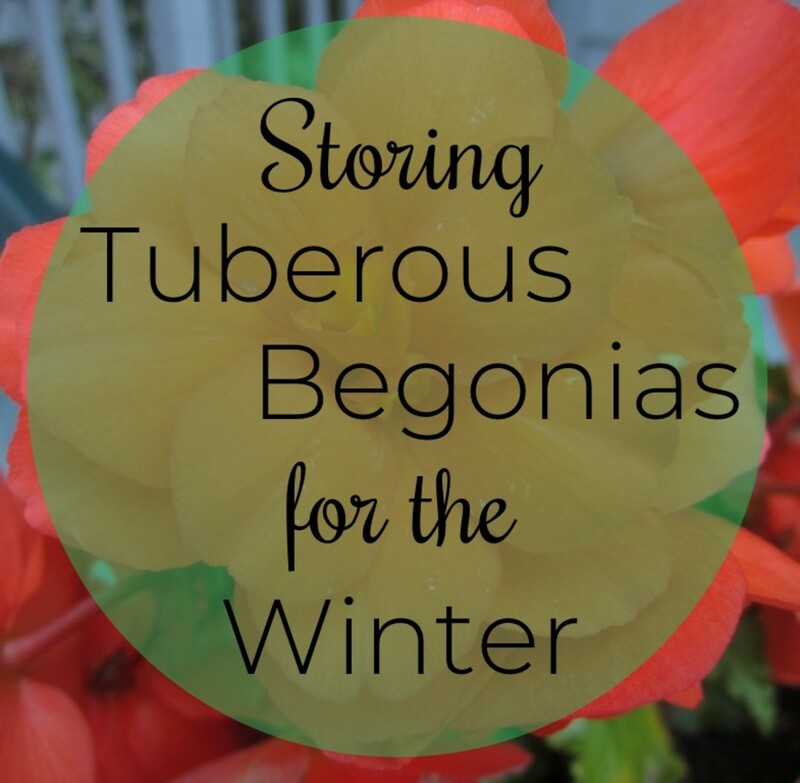 This will help them survive the winter better. As it takes time to propagate, early summer provides the best amount of time for trial-and-error before the first frost comes. 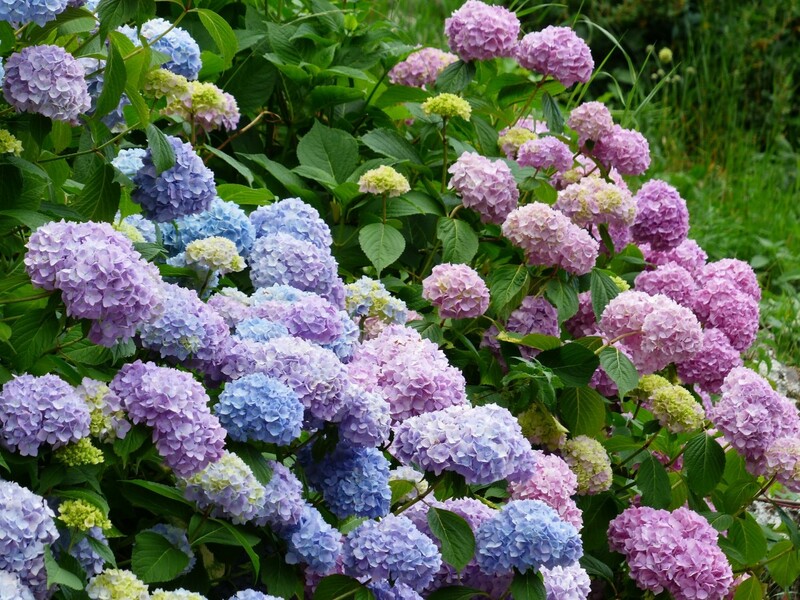 If you grew hydrangeas, what color would you be more likely to pursue? Neutral/Purple. Hydrangeas are nature's pH strip. This goes to show my soil is rich in minerals, and that's fine in my book. Blue. Alkaline already exists in the soil, so why not add more to it? It's a step harder than leaving it at neutral, but nothing is taken out. Pink. It's a bit harder, and it may take more time. But I'm ok with waiting a few years to perfect my soil's pH composition. Red, I'm a die hard.